Check out weeks 1&2, 3&4, 5&6, and 7&8 here! A lot of big things happened over the past two weeks. There was a solar eclipse. Taylor Swift released her first song in an eternity. And I spent more time talking on the phone than 92.6% of millennials will in an entire year (statistics based on a nonscientific guess). 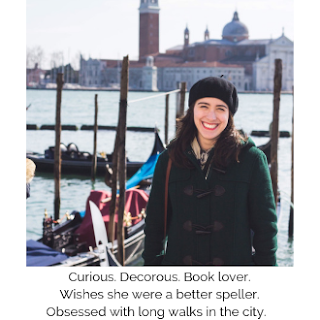 Since I last wrote, the majority of my time has been spent connecting with other IBMers, getting involved with a variety of projects, and prepping for the upcoming sales role play extravaganza next week. As I’ve expressed before, I have a particular interest in the financial services market due to my experience last summer and my business education. I’ve been learning as much as I can about IBM’s presence in the industry by having conversations with sellers from a variety of teams. 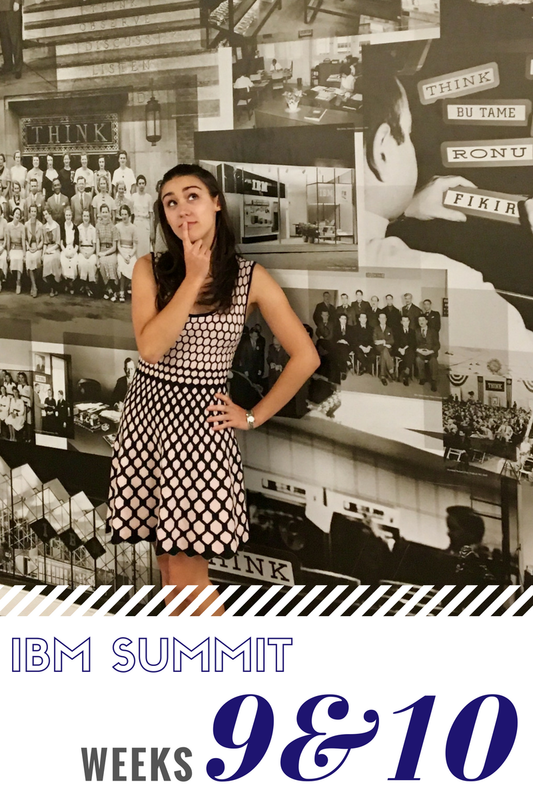 They all have diverse backgrounds, from lifelong IBMers to sellers who came from a multitude of roles in the financial industry, I have been able to gain insights from all of them. Some of my favorite advice includes always choosing to listen rather than talk, to take the lead with whatever is given to you and don’t be afraid to make things happen, to always speak up for yourself, and to not take things too personally. Aside from learning from others, I have also been engaging in projects to develop through a hands on approach. This spans from prospecting projects (sound familiar from last summer…?) to territory planning, and reading documents pertaining to financial services clients. The beauty of the Summit program is that we are empowered and given the autonomy to structure our time and seek out high value experiences. Nothing beats talking to someone, being referred to someone else, and then somehow ending up in meetings and getting an inside look into what you will soon be doing. I’ve learned that nothing happens until you ask, and I make it my mission to continually offer my help and ask to shadow so I can get as much as exposure as possible before my training comes to an end. One of my highlights from the past two weeks was spending the day with a Software Client Leader (who you may remember her from last summer), Kristin, and getting engaged with her client. Getting to move around and talk to others is one of my favorite parts of sales (I can’t sit at a desk all day, every day) so I jump on every chance to venture out. My fellow summits and I went down to Astor place and made an important discovery on the way. 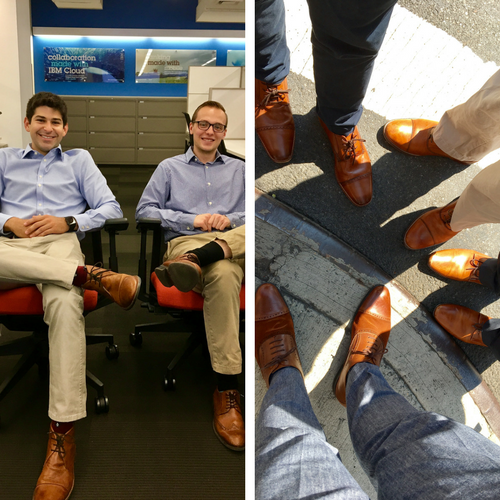 Apparently, if you are a young male professional you absolutely must wear brown dress shoes. It’s also a good idea to wear a blue shirt, tan pants, plus your favorite brown shoes like Lawrence and Max (shout out to these two for taking my picture by the "Think" wall for this weeks’ blog as well!). The rest of my time was dedicated to preparing the deliverables associated with the next global sales school challenge that has to do with feeding our pipeline with my team. Sellers always need to be prospecting and in this challenge we learned how to prepare for initial client conversations, and next week we’re off to headquarters to practice these types of calls through role plays. I was the team leader for this challenge and it was a good way to learn how to collaborate and make decisions for the group. I am excited to see everyone from my stream back together where we all first met at our initial training! Have a great weekend and remember that if you are unsure of what to wear on your night out on the town, take a page from Lawrence’s and Max’s book.